When we see kids who struggle with social skills, it’s hard to watch. We want to support them and teach them socially acceptable ways of interacting. So, we do worksheets and talk about what’s expected. And they can tell us exactly what the expectations are in those social situations, but somehow that knowledge doesn’t translate into real-life experiences. 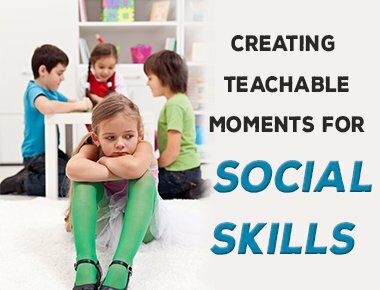 How do we teach social skills so that kids will act in expected ways? How do we teach them and have them translate those skills into other areas in their life? I believe we should start teaching social skills by playing. Play is the most natural way children interact with the world and learn about it. Children can learn about problem-solving, advocating for themselves, making decisions, working in groups, sharing, and resolving conflicts all by playing. As children develop and	grow, so does their way of playing. Mildred Parten (1932) did some great work observing youngsters at play and formulated the stages of social play for children. Let’s take a brief look at precisely how social play develops and changes over time for children. There are six stages of social play, and it starts at birth. I know this can be hard to believe, but play starts at birth. You know those random movements that infants make with no clear purpose? This is the beginning of play. This stage, which starts in infancy and is common in toddlers, is when children start to play on their own. When engaged in solitary play, children do not seem to	notice other children sitting or playing nearby. Just because it starts in infancy and toddlerhood doesn’t mean it needs to stop. All age groups can (and should!) have some time for independent, solitary play. Onlooker play happens most frequently during the toddler years but can happen at any age. This stage is when children watch others play. The child who is looking at the others who are playing may ask questions of other children, but there is no effort to join the play. This may happen when a child is shy, or unsure of the rules, or is hesitant to enter the game. Parallel play is usually found with toddlers, although it happens in any age group. Parallel play starts when children begin to play side-by-side with other children	without any interaction. Even though it seems like they are not interacting, they are paying attention to each other. This is the beginning of the desire to be with other children. This stage starts to lay the groundwork for the more complex social stages of play. At around three to four years of age, children eventually become more interested in the other children rather than the toys. At some point, a child will start interacting more with the other child they are playing with; this is called associative play. They start asking questions and talking about the toys and what they are making. This is the beginning of understanding how to get along with others. During associative play, children within the group have similar goals (for example: building a tower out of blocks). However, they don’t set rules, and there’s no formal organization. Children will begin to socialize starting around three or four. They begin to share ideas and toys and follow established rules and guidelines. They play shop and figure out who will play what role. They can work together to build something or maybe play a simple game together. This is where a child learns and practices social	skills, like cooperating, being flexible, taking turns, and solving problems. As children proceed through the stages of play, their play becomes more complex and involves more and more interacting with others. For children to practice social skills like cooperating, compromising and problem-solving, the best way to do that is to let them play. They’ll remember the rhythms and melodies of social interactions much more smoothly if we allow them the time and space to play. Social skills are complex and can encompass so many different types and layers of skills. But learning social skills is a vital component of the social and emotional development of children. The Collaborative for Academic, Social, and Emotional Learning (CASEL) is the “nation’s leading organization advancing the development of academic, social and emotional competence for all students” (About CASEL, 2018). They have a wealth of information about Social Emotional Learning and have identified five main areas of social and emotional competence. These are self-awareness, self-management, social awareness, relationship skills, and responsible decision-making. Using the CASEL framework (CORE SEL Competencies, 2017), here’s what we might expect to see from elementary school students who are developing their social skills. So now we know, play is the best way to learn. We also know that children can develop social and emotional skills, just as they develop other skills in their life. But what about those kids who are struggling to make it through? The kids we see who are lagging behind in developing their social skills? Like Justine from the beginning of the	blog? Rick Lavoie, the author of It’s So Much Work to be Your Friend (2006), writes about those kids who struggle in the social sphere. He talks about the spiral of social skills to help kids who struggle develop these important parts of themselves. First, you learn the skills, then apply and use them in real social situations. Those positive interactions make it more likely that your circle of friends will grow, allowing for more social opportunities, and chances to practice those skills. To get better at the skill, you need to use it in real situations. For those of us running groups, I’d like you to think of your time with kids in group as one of those real-life situations. If kids are coming to us to be in a social skills group, it means they have struggled in this area, and probably haven’t had much success in other social arenas. We want to do the best we can to teach them the skills, AND give them those real-life opportunities to practice. We know how to talk to kids about social skills. We can have the conversations. Now it’s time to create the experiences for them so that they can practice what it feels like to use these social skills in real places. Because they are in a group, we adults can act as scaffolds for them - helping gently guide them to more prosocial behavior in groups and complimenting and reinforcing their positive interactions. Let’s create these real-life teachable moments to help support children as they continue to grow and develop in their social repertoire. Get over 75 easy and ready-to-use games and activities for building better relationships, problem-solving and improving communication when you buy my book Social Skills for Kids. This rich resource includes reproducible, step-by-step plans for how to play, alternatives to each activity, and debriefing questions to reinforce learning. Get 20% OFF plus FREE Shipping with promo code FREESocialSkills. Click here to redeem discount! Janine Halloran, is a Licensed Mental Health Counselor with over 17 years of experience working with children, teens and their families. She is the founder and CEO of Coping Skills for Kids, where she creates and curates tools & resources to help adults teach kids healthy ways to deal with stress, anxiety and anger. She is the author of the Coping Skills for Kids Workbook. She is an NBC Parent Toolkit Expert and has written articles featured on their blog. In addition, she has written for several other publications, including Hey Sigmund, Confident Families Confident Kids and Bay State Parent Magazine. She’s worked in a variety of settings, including schools, residential programs and outpatient mental health facilities. She is in private practice and offers consultation.